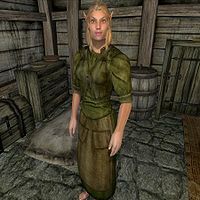 Carwen is a Bosmer acrobat who lives in Methredhel's house in the Imperial City's Waterfront District, and is a member of the Thieves Guild. She is confident that she will be famous one day, evident upon initiating a conversation with her. Being a lower rank Footpad in the Thieves Guild, Carwen is determined to make it in the big city; it will, however, be Methredhel who will advance in the Guild and make a career, while Carwen will have to keep up her daily routines. On regular weekdays (Morndas to Fredas) she sleeps in the house between 6am and noon and then strolls around inside all afternoon. At 6pm, she travels to the Talos Plaza District and enjoys a four-hour dinner at The Foaming Flask. She heads back home at 10pm, stays there until midnight, then heads all the way to the Market District where she spends the night wandering around the area near The Gilded Carafe, regardless of weather. At 5am she heads back to the shack in time for her bedtime at 6am. During the weekends, she will change her routine completely; on Loredas she visits the Temple of the One at 2pm and then heads back to the house at 6pm, skipping dinner. At 11pm she pays a quick visit to the Market District before heading back to the shack at midnight. On Sundas, she wakes up early at 10am, travels to the Temple District for a bit of strolling before entering the Arboretum at noon. At 6pm she returns home; when the clock strikes midnight and another week starts, Carwen will return to her usual routines and spend the night in the Market District. There are a few exceptions to her daily schedule: during the quest May the Best Thief Win, presumed that Methredhel beats you to the diary (stage 20), Carwen will break off all her routines and instead spend the entire day and night wandering in the Arboretum without ever eating nor sleeping; once the diary has been delivered to Armand Christophe, Carwen will resume her usual routine. Also, during the quest Misdirection, Carwen will, along with all the other Waterfront residents, be confined to her home. After The Ultimate Heist, on Loredas and Sundas, Carwen will take advantage of the newly opened headquarters and enter Dareloth's House every evening at 6pm for eight hours, resuming her usual routines at 2am the next morning. She wears a leather cuirass, green felt linens and a pair of leather boots. She is armed with an iron dagger and an iron bow with iron arrows. She carries a spare stitched green shirt, the key to her house, and a small amount of gold. She will introduce herself with "My name is Carwen. Remember. I'll be rich and famous one day." When asking her about the Imperial City she will say "I'll get mine. Folks in this city got plenty of gold. Take from the rich and give to the poor, if you catch my drift." Esta página foi modificada pela última vez à(s) 00h25min de 23 de abril de 2013.